There we were, earlier in the year, stuck in traffic on the Autobahn. Out of the corner of my eye I noticed a distinctive shark-nose appear in view, it could only be a BMW E28 5-Series. Technically this isn't a BMW, it's an Alpina. But it looks like a BMW - so how does that work then? Well Alpina are registered as a manufacturer in their own right rather than existing as an aftermarket tuning company, such is the amount of work undertaken on each of their cars and their relationship with BMW themselves. This B9 3.5 started out as a BMW 528i (when Alpina launched the B9 in 1981 that was the top of the 5-series tree, the 535i and M5 didn't come until later). Alpina binned the 2.8 six in favour of the 3.5 from higher up in the BMW range and treated it to heavy modifications to further increase power by 27 horses to 245bhp. Of course, such an increase in power requires upgrades to suspension and braking and Alpina duly obliged. The distinctive Alpina wheels immediately set the B9 apart from a regular 5er along with the striking front and rear bodywork addenda and reworked interior. All this amounted to quite an increase in performance, 0-60 in under 6.5 seconds and over 150mph at the top end. The B9 was the first Alpina to be based on the E28 5-series but they followed it up with the quicker still B10 four years later. I adore the E28 5er, and I adore Alpina cars in general, Burkard Bovensiepen is a man who is responsible for some legendary BMW-derived cars over the years. I have to say though that the ultimate E28 for me is, and always will be, the M5. This was one of the greatest Q-Cars of all time. A virtually standard-looking 5 (unlike the bespoilered Alpinas) packing an almighty 286bhp BMW Motorsport 3.5 six. The BMW M-Division hand-built nearly 2,200 of them. The factory may have done it better, but the Alpina (as is usually the case) was there first. Both are a rare treat to see today. At 115mph you deserve to be behind bars. When Alfa Romeo design a high performance car for family drivers there are a number of factors they take into consideration. And these add up to safety. Because as roads become busier the need for your family's security becomes vital. The 2.0 litre Giulietta was created to give this security without reducing the excitement of driving an Alfa Romeo. The twin overhead camshafts, twin choke carburettors and electronic ignition deliver scorching acceleration and reserves of power that no other car in its class can offer. And the distinctive wedge shape creates a wind cheating aerodynamic profile that is stylishly Alfa Romeo. The cut-off tail with integral spoiler ensures that the air glides off with minimum turbulence to enhance roadholding and convert maximum engine power to wheel traction. 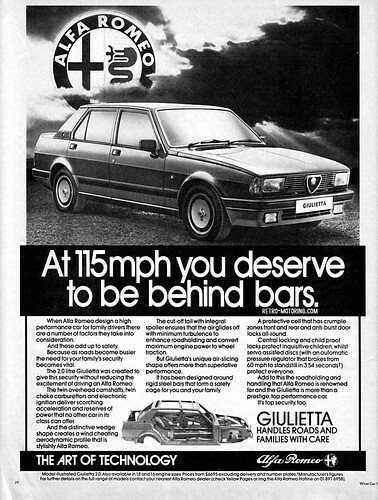 But Giulietta's unique air-slicing shape offers more than superlative performance. It has been designed around rigid steel bars that form a safety cage for you and your family. A protective cell that has crumple zones front and rear and anti-burst door locks all-round. Central locking and child proof locks protect inquisitive children, whilst servo assisted discs (with an automatic pressure regulator that brakes from 60mph to standstill in 3.54 seconds) protect everyone. Add to this the roadholding and handling that Alfa Romeo is renowned for and the Giulietta is more than a prestige, top performance-car. Mini Red Hot & Jet Black - Move To The Music! Take a look at our new Red Hot and Jet Black Limited Edition Minis and fall in love. In return for inspecting these two stylish newcomers, we'll send you a fabulous complimentary cassette containing 8 great soul and chart hits. And, when you buy a Red Hot or Jet Black Mini, we'll also send you a Sony Walkman WM 33, absolutely FREE. Simply ask your dealer to authorise this claim. Colt Sapporo - luxurious flagship of the exciting Colt range, this high flyer offers top performance with sleek, coupé styling and comfortable four-seat accommodation. Power steering is a standard feature of the Sapporo along with push-button radio, tinted glass, laminated screen and 5-speed gearbox. Automatic is available as an optional extra. Pictured is the 'Colt Sport' version which develops 136bhp at 5000rpm realising a top speed of around 120mph. Features of this model also include a vinyl roof and wide profile alloy wheels. Girl in car wears a grey slip of a dress with petticoat straps. Style No. 478. £89.95. Second girl wears a white draped dress with one gold embroidered shoulder and thigh-high side slit skirt. Style No. 510. £39.95. Both dresses are Ban-Lon and designed by Anne Tyrrell for John Marks. It's easy when you know how. Learn escapology with Colt cars and John Marks clothes - they've got it down to a fine art! The new front wheel drive Colt 1400 hatchback. This new '79 model features the unique Colt 'Supershift' twin-range gearbox. Glistening alongside in a white dress with silver embroidered bodice tied on the shoulder and front slit skirt. Style No. 502. £54.95. Available with a choice of 1200, 1400 and 1600cc engine, the Lancer is renowned for its many inernational rally successes like the East Africa Safari and the Australia Southern Cross. Its smooth flowing lines and 102mph performance (1600 Sport) help make the Lancer one of Colt's most popular models. With the Lancer, pale bronze dress with lace crew neck bodice. Style No. 464. £59.95. Both dresses are Ban-Lon and designed by Anne Tyrrell for John Marks. 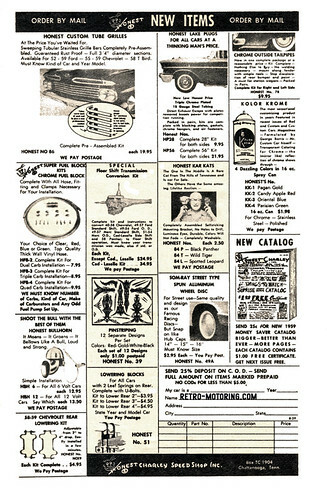 Ban-Lon is the registered trade mark of Joseph Bancroft & Sons Inc. USA. Reprinted from Vogue, October 1979. Quality and reliability in manufacture and performance have helped to establish Toyota as one of the most popular car manufacturers in the world. In Britain alone, more than 150,000 motorists are Toyota owners. And you, as one of them, have the satisfaction of knowing that you're backed by one of the finest parts and accessory services available - The Toyota Genuine Parts Service. All Toyota Genuine Parts are manufactured to the demanding standards of the Toyota Motor Company. Which means that your local garage, or you as a do-it-yourself man, can always be assured of getting the highest quality parts for servicing your Toyota - not matter what age or model - from your Toyota dealer. As for ready availability, more than 33,000 separate lines are held in stock in Toyota's vast warehouse in Crawley, Sussex, to supplement - at short notice - the wide range of parts and accessories already held by your own Toyota dealer. Always ask for Toyota Genuine Parts - the original parts made specially for your Toyota. This brochure will introduce you to more of the benefits of owning a Toyota - one of the greatest cars in the world. The following pages illustrate a wide selection of parts, accessories and exchange items that are readily available to make running and maintaining your Toyota as easy and trouble-free as possible. Don't miss the clothing section. It shows a range of fashions designed to put you and your family into Top Gear! It's amazing what can be seen when out and about. A random trip into North Wales lead me past this 1980 Triumph TR8 parked up at the side of the road. What amazing patina! It looked to be solid, although the metallic pink paint was definitely not standard so who knows what may lurk underneath. Buy a print copy of this advert in my eBay shop! Ideal Christmas gift for a VW Beetle fan! Convert original heater to an efficient heater-blower system. Circulate warm air evenly throughout entire vehicle. Complete kits include motor-blower unit, push-pull switch, flexible duct hose, wire, screws and instructions. Now! 1970 Porsche 911S-type styling for Volkswagen and all other 15" wheels! Lightweight aluminum full wheel discs feature the latest deep-dish sports car look. Sparking chrome spokes and rim accented by a contrasting black backgroun add an expensive appearance to any car. "Mini trunk" attaches to your car like a trailer, yet is compact and mobile enough to roll right into your motel room when traveling! Slips over spare tire, holds tools and small items. Increase power to 100hp! Have POWER to spare by installing a larger, more powerful Corvair engine in your Volkswagen car, Transporter, Karmann Ghia or Dune Buggy (using Volkswagen chassis). Mounts on transmission hump under dash panel. Beautify the interior of your Volkswagen with these attractive, functional consoles. Add competition look, incresed engine cooling by cutting vent hole in body.